You may not realize that the hair on your head, arms, face and everywhere else on your body is constantly passing through one of four phases in a complex cycle. 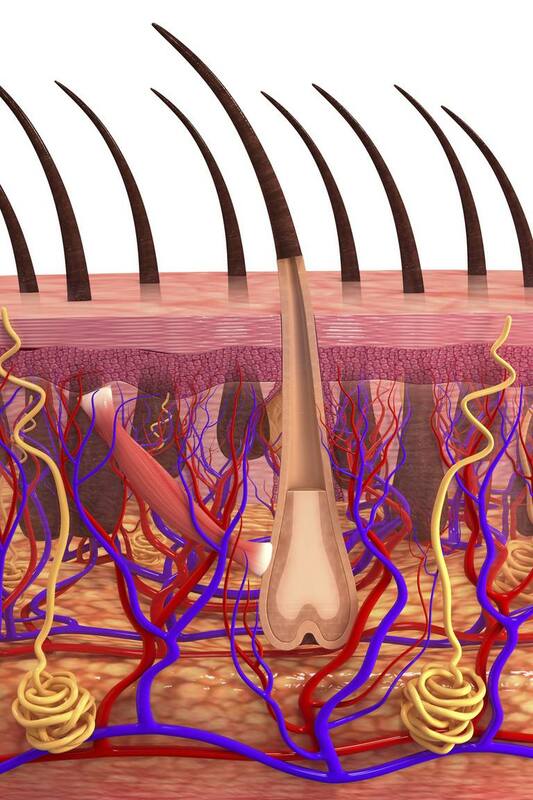 Growing from underneath the skin, hair extends from a root, known as a follicle. And from the time each hair starts to grow to the time it falls out many years later, it cycles through four stages: anagen, catagen, telogen, and exogen. The first phase, anagen, is the growth phase, which can last between two and seven years. This phase and its length determine how long the hair becomes. The catagen phase, also known as the regression phase, comes next and only lasts about 10 days. During this time the hair follicle shrinks and detaches from the dermal papilla. The third phase is telogen, which lasts about three months. The fourth and final phase, exogen, is when the hair eventually detaches and falls out. During telogen, the resting hair remains in the follicle until it is pushed out by the growth of a new anagen hair. The telogen phase is the resting phase of the hair follicle. At any given time, 10 to 15 percent of all hairs are in the telogen phase. This phase lasts for about 100 days for hairs on the scalp and much longer for hairs on the eyebrow, eyelash, arm, and leg. During this phase, the hair follicle is completely at rest and the club hair is completely formed. Pulling out a hair in this phase will reveal a solid, hard, dry, white material at the root. Anything that disrupts the hair growth cycle can cause more hairs to enter the telogen phase. When this happens, a greater amount of hair will shed when the hairs enter the exogen phase a few months later. This excessive shedding is known as telogen effluvium, and while the hair loss is diffuse (spread over the entire scalp), some people may notice more loss near the front of the scalp. There are different types of telogen effluvium. They are caused by different circumstances and cause hair loss in different ways. Another type of telogen effluvium can occur when the trigger that disrupts the hair cycle is ongoing, for example, a thyroid disorder or nutritional deficiency. Because of the ongoing trigger, the onset of hair loss is more gradual and it lasts longer. In this type, rather than a greater percentage of hairs suddenly entering the telogen phase, the hairs go into resting as they normally would but stay there longer. This delays the return to a growth phase, and eventually, the number of hair follicles in the telogen state grows while fewer hair follicles are growing hair. The effect is a progressive and overall thinning of the hair without much noticeable shedding.